Beloved husband, father and grandfather passed away Monday, November 27, 2017. Age 78 years. 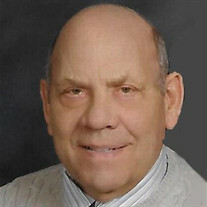 The son of the late Joseph and Hattie (Mielke) Martin, Ron was born April 25, 1939 in Saginaw, Michigan. He served in the U.S. Marine Corps from 1957-1960 and served in the Reserves until 1963. He married Nancy Lincoln on June 3, 1994. She survives him. Ron was employed at General Motors for 50 years until his retirement in 2004 where he served as a Committee Man for over 20 years. He was a member of Holy Spirit Catholic Church. Knights of Columbus Council #4232 and U.A.W. Local #668. He enjoyed hunting, sports and loved time spent with his family. Surviving besides his wife Nancy are two sons, one daughter and their spouses, Donald and Kathy Martin, Charlotte, North Carolina; Daniel Martin, Flatrock, Michigan; Diana Schmiegel, Saginaw; five grandchildren, Amanda Martin, Douglas Martin, Adam, Patrick and Grace Schmiegel; step-children, Tammy and Mark Hermansen, Harrisville, Michigan; Karen and Mark Vanderlin, Iron River, Michigan; Deborah and Mark Horswill, Coleman, Michigan; Brenda Moening, Las Vegas, Nevada; step-grandchildren, Noelle Lincoln, Robert Pitt, Ryan, Aaron and Michael Schalow, Mallery (Max) Campbell, Cameron Beck, Jessica Lincoln, Dylan (Jennifer) Mullikin; 10 step-great-grandchildren; one great-great-step-granddaughter; two nephews and one niece, James (Joan) Martin, Joseph (Lisa) Martin Jr. and Arleen Martin. Ron was preceded in death by a son, Kurt Martin, three brothers, Joseph Jr., Donald and James Martin. Funeral Liturgy will take place 10:00 a.m. Friday, December 1, 2017 at Holy Spirit Catholic Church, 1035 N. River Road in Saginaw. Rev. Fr. Peter Gaspeny will officiate. Interment will follow in Westside Cemetery where military honors will be presented by V.F.W. Post #1859. Friends may call at The Snow Funeral Home, 3775 N. Center Rd., (between Shattuck and McCarty), where the family will be present on Thursday from 2:00 p.m. to 8:00 p.m. and at Holy Spirit Catholic Church on Friday from 9:00 a.m. until time of Mass. A Vigil Service, led by Kathleen Myles, Pastoral Associate, will take place 7:00 p.m. Thursday at the funeral home. Those planning an expression of sympathy may wish to consider memorials to the Kidney Foundation.